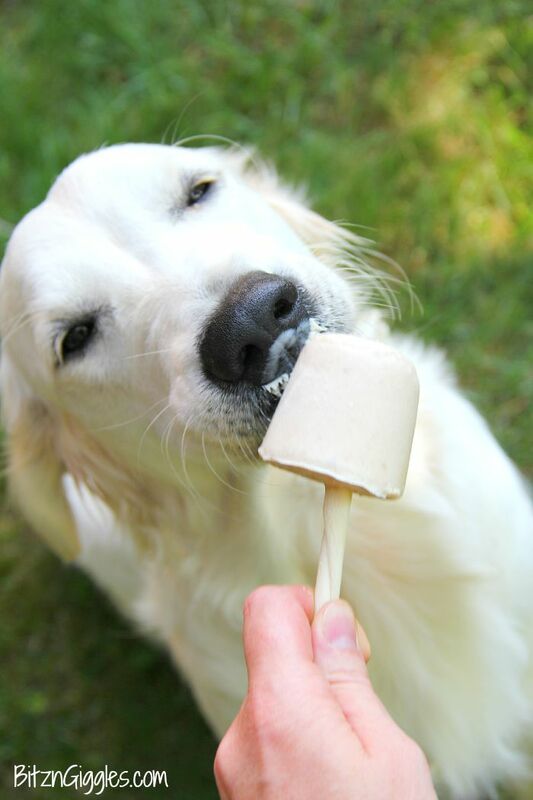 Banana Pup Pops – A creamy, homemade popsicle that your dog will love! Delicious and good for them too! What to do, what to do with. . .VERY ripe bananas. Most people would make banana bread. Which I have also done in the past, but this time I opted for creating some delicious treats for our beautiful golden retriever, Belle. Banana Pup Pops! Also known as pupsicles or popsicles for dogs. No, no that’s still not quite right. They’re more like pudding pops for dogs. Yep, I’m feeling better about this now. Let me tell you what. If you have a furry family member in your home that adores their treats, well, then, you’ve come to the right place. 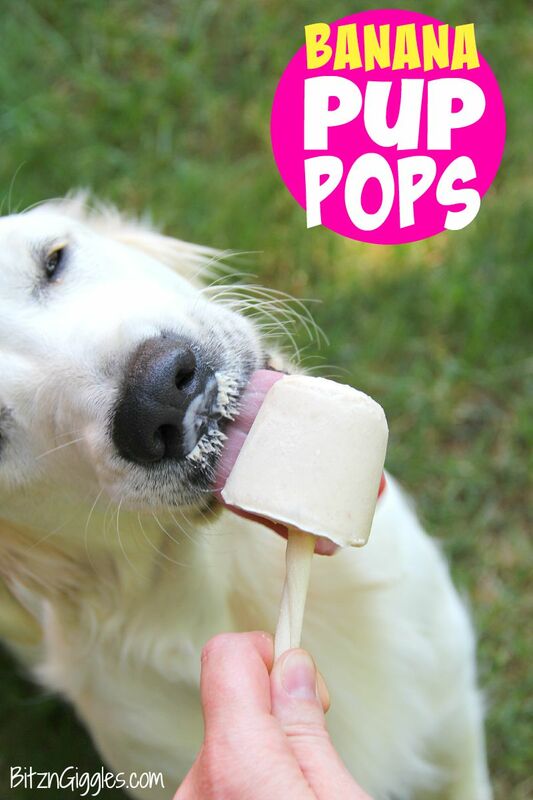 These pup pops will have your pet performing, behaving, doing whatever it needs to do to sink their teeth into one of these babies. Trust me. You’re going to see evidence of the deliciousness in a few seconds. Put all ingredients into food processor or blender and mix until well-combined and smooth. Divide the mixture into four paper cups. Position a rawhide stick into the middle of the cup. Place the cups in the freezer for at least 4 hours. Peel the paper cup away from the pop and let your pup enjoy! So, making the pops is SUPER easy. All you need is a blender or mini food processor to blend up the ingredients. THREE ingredients – count them, 3. 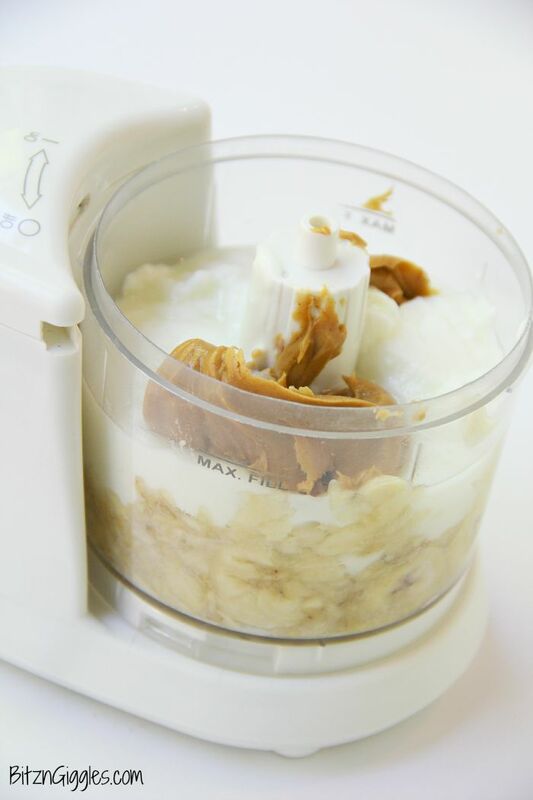 Plain yogurt, banana and peanut butter. Simple? I’d say. Let’s get on to the next step. You know those little paper cups you use for drinking and rinsing your mouth after brushing your teeth in the bathroom? Yep, those – the little 3 ounce ones . You’re going to need 4 of those. I just happened to have some animal-themed ones I use for the kids in our house. Perfect. After blending the yogurt, banana and peanut butter, fill your four cups a little over 3/4 full – just leave a little room at the top. Position a rawhide twist into the center of each pop. If you don’t like giving your dog rawhide, you could always use a peanut butter stick . Place the cups in the freezer for at least 4 hours. When pops are frozen, unwrap the paper cup from the pop. Wanna’ see what happened when I shared a pop with Belle? Did I have one happy pup on my hands! Do you remember the Tootsie Pop slogan, “How many licks does it take to get to the center of a Tootsie Pop?” That’s what came to mind when feeding Belle her treat. LOL She licked that pop like nobody’s business and then finished strong with chewing up the rawhide stick, too! Our little Belle. She’s so much fun! I hope you enjoy making these for your dog, too. They’re going to love you for it. I promise! FOR MORE PUP POP FUN, CHECK OUT. . . Your dog is adorable!! Mine will absolutely love these (I love that they’re easy to make)! I always let my dog lick the ice cream bowl, so to have her own treat will be amazing! Thank you, Patricia! I’m sure she would enjoy them! And I’m sure she’ll still expect to have dibs on your ice cream bowl with or without treats of her own! WOW! Scout would LOVE these! 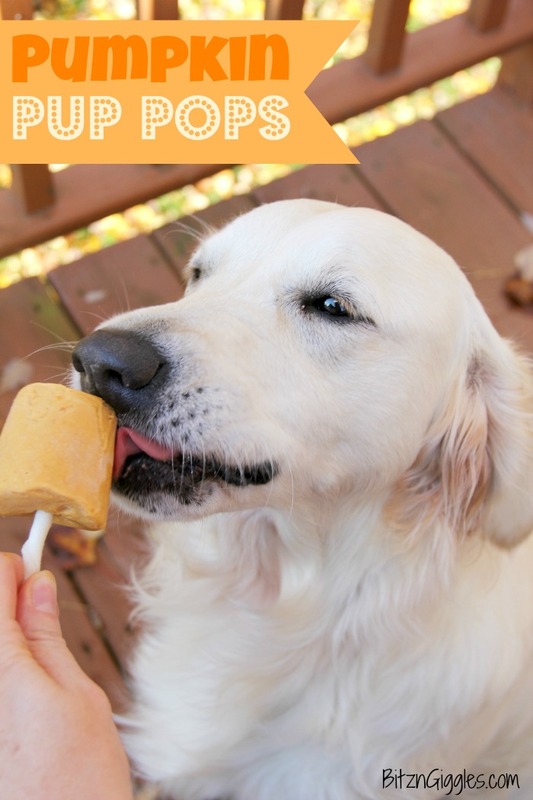 We love homemade pup treats at our house, we will have to try these asap! I’m betting Scout will love them! What a fun idea! I’m not sure who would enjoy this more, our dog or the menagerie who would without a doubt want to help make them! That’s the best part! Getting the rest of the family involved! My kiddos love to hold the treats for Belle while she enjoys them! What a great idea! I need to show this to my daughter so she can make them for her doggie friends. If I had a pup, I would for sure make them these little treats! I hope your pup enjoys it! Our Belle loves them! Can’t wait to make these and I Loooove the photo! Hilarious! ? HA! Our little Belle is such a goof. I hope your fur baby loves these pops just as much as Belle!! I make these with fat free vanilla yogurt, Peanut butter, banana baby food, and a touch of cinnamon. But I think the banana pieces would add more texture and I’ll do that from now on. My dogs love these treats. And if you don’t have the rawhide, use a dog biscuit…. YES! You can definitely use a dog biscuit as the “stick.” Your version sounds really yummy! Hi Brenda, you could try coconut cream, maybe. Allow a can of full-fat coconut milk to settle – about 30 minutes. The coconut cream will rise to the top and can easily be skimmed off to use for the pup pops. Let me know if you try it! I can’t wait to get back home & try these on my three pups. One of them is a Pyr – is that what yours is, too? the noses are so similar!!! We ALWAYS have leftoverly ripe bananas & I get tired of banana bread. Thank you for your recipe! Belle is an English Cream Golden Retriever. I hope your pups love these pops as much as Belle does! This was so easy to make! I think this is a wonderful recipe! 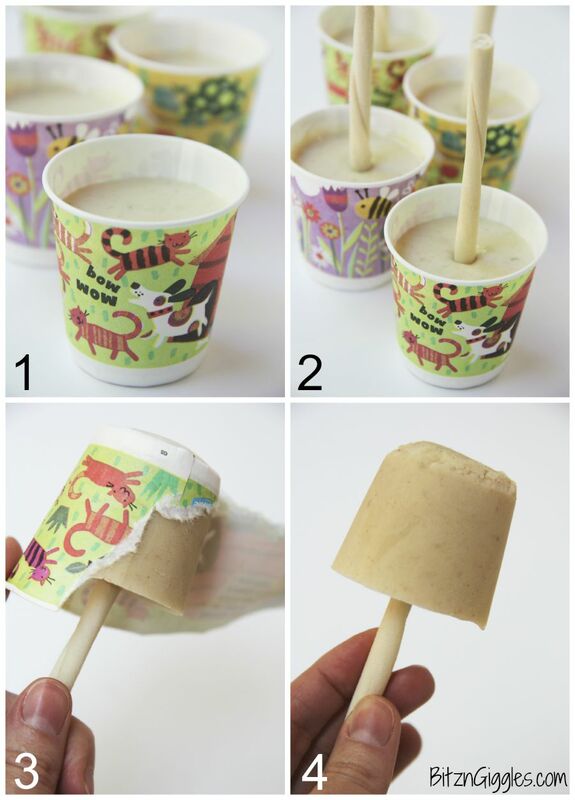 I plan to try this and instead of making a pupsickle, filling the mixture into a Kong and freezing. I would like to mention how incredibly dangerous and poisonous rawhides are. Please consider suggesting an alternative to rawhide. Rawhide go through an intensive production process of being soaked in bleach and dangerous chemicals. Dogs cannot naturally digest rawhides, so they either pass the way they were swallowed, or they can cause life threatening intestinal blockages. The Dingo dental sticks you suggested as an alternative to rawhide list RAWHIDE as the first ingredient. A bully stick is an appropriate alternative to rawhide. All natural and digestible. I made these with vanilla yogurt and I had popsicle sticks so I used those and just held on to it so my pup didn’t eat it. My Reggie loves them on a hot day! Thanks for sharing! My dogs absolutely loved these!!! Super easy to make and doesn’t break the bank ? Let me know if Cooper enjoyed them!